Get a great workout, take a relaxing paddle, cruise the lake, or have some exhilarating fun! Open April through Early October. Perfect for a morning or early evening workout, a fun date, sightseeing, bachelor or bachelorette parties, or relaxing family bonding. Available on Lake Norman Only. Must reserve in advance; no walk-ups. Available from 10am-7pm. The ultimate SUP & Kayak experience! Watch the sunset, and glow in the night. Beautiful scenery and amazing pictures. Every night from 7:30pm-9:30pm! Take your rental paddle boards to your favorite spot on Lake Norman or Mountain Island Lake, on your beach vacation, or wherever you want. Our sturdy inflatable paddle boards will fit in the trunk of any car (no rack required) or even on an airplane. Renting a house on Lake Norman? Just don’t feel like driving? For your convenience, we’ll bring the paddle boards, kayaks, or jet skis to you–anywhere on the lake in Cornelius, Davidson, and Mooresville. May deliver further for extra charge; call us to discuss. The Best Stand Up Paddle Board, Kayak, Boat & Jet Ski Rental Experience Around! We love what we do! Watersports aren’t just our business; they’re our way of life. When we’re not on the water, we’re planning our next on-water adventure. We’ve been in the watersports rental business since 2008 and have served thousands of happy Lake Norman residents and vacationers. What’s Up Watersports offers affordable prices, superior customer service, eye-catching paddle boards, kayaks, boats, & jet skis, and modern technology for a one-of-a-kind rental experience. You can check real-time availability and book rentals 24/7 on our website. If you feel more comfortable calling, we are available by phone at 704-931-8787 (8SUP). You can also use our Online Chat to instant message/text with us live. All reservations must be made in advance! We send you all the details you need ahead of time, so you can just show up and get out on the water! 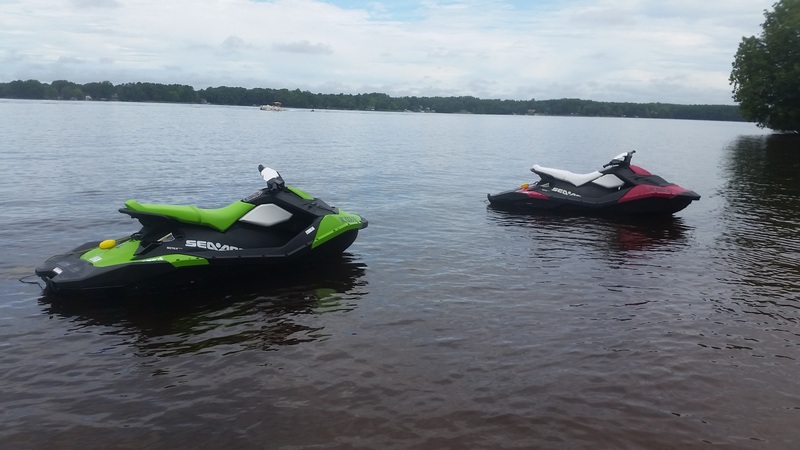 For our Lake Norman jet ski rentals, we put you on the latest and greatest in PWC technology–brand new Seadoo Sparks and Seadoo GTIs. Seadoo Sparks have brought the fun back into jet skiing. Jet skis, in general, have gotten far too big and heavy–thus limiting the “playfulness” and guzzling gas at alarming rates. Our Seadoo Sparks are light and stable, maximizing the horsepower-to-weight ratio for an unmatched get-up-and-go feeling. They are also the most fuel-efficient PWCs on the market–greatly minimizing your gas cost on your rental. You must be 18-years-old to rent and drive our jet skis. Must bring a valid driver’s license to the rental. Passengers must be at least 5-years old. All minors must have their parent/guardian sign a waiver on their behalf at the time of rental. We provide operation & safety instruction, life jackets, maps, recommendations of where to go, and everything else you need for a truly exhilarating and enjoyable experience. Our Lake Norman launch location is at Long Island Marina in Catawba, NC. Easily accessible from Charlotte, Hickory, Statesville, Greensboro, Winston-Salem, and the entire Lake Norman area. Prices start at only $139 for 2 Hours! Reserve your jet ski rental today! We require a $500 refundable deposit per jet ski–paid on a credit or debit card. Our Lake Norman Ski & Pontoon Boat Rentals offer a relaxing way for families and friends to experience everything the lake has to offer. Park in a cove and go for a swim, drive to a lakeside restaurant for lunch, pull tubers and skiers, or just enjoy your favorite beverages with great company! Our boats can fit up to 8-14 people depending on the boat. You must be 18-years-old and have a valid driver’s license to rent and drive our boats. You must bring a your valid driver’s license to your rental. Passengers can be any age. Please bring your own life jacket for any child under 30 pounds. We offer 4-hour and 8-hour rentals only (10am-2pm; 3pm-7pm | 10am-6pm). We require a $500 refundable deposit per boat–paid on a credit/debit card. You are welcome to bring food, just be sure to clean up after. Beer and wine are allowed (no liquor); consumption must be responsible and only by those 21-years old and up. The driver(s) of the boat cannot consume any alcohol. Pulling tubes, skiers, etc. is allowed on designated boats. We also offer stand up paddleboard (SUP) rentals and sales because paddle boarding is an activity that truly anyone can enjoy–kids, young adults, parents, and grandparents! You can get an amazing workout with friends or just take a leisurely paddle, have an on-water picnic, and enjoy the amazing sights! Prices start at only $20 for 1 Hours! Reserve your paddleboards now! Our Lake Norman launch location at Long Island Marina is in a quiet area of the lake–with quick access to Balls Creek & Waterfall (no boat traffic). Book Now. We now offer Kayak Rentals for your paddling pleasure! We have single sit-in and sit-on kayaks and tandem (2-person) sit-on kayaks. Ages 8-17 are allowed on their own kayak (with an adult on the water with them). Children under 8 can ride with an adult in a tandem kayak. Prices start at only $20 for 1 Hour! Reserve your kayaks now! Our Lake Norman launch location is in a quiet area of the lake–with quick access to Balls Creek & Waterfall (no boat traffic). Our unique “Grab & Go” service allows you to paddleboard anywhere you want! Our high-quality, amazingly sturdy inflatable paddle boards roll up to the size of a small duffel-bag–thus fitting in any size car and even on a plane. So, grab a paddle board and take it to your favorite spot on Lake Norman, or take it on your next beach vacation! Book Now. We also offer Sunset Night Paddling rentals, where we give you lights to put on your kayak or paddleboard–allowing you to experience your out-of-water and in-water surroundings like never before! Book Now. Looking to buy a paddleboard? We have, without question, the most eye-popping, high-performance boards in the Lake Norman area! Call us at 704-931-8787 (8SUP) or email us to schedule a viewing/demo. We proudly serve Lake Norman the Catawba River in the cities of Charlotte, Mooresville, Davidson, Cornelius, Huntersville, Troutman, Statesville, Concord, Denver, Sherrills Ford, Catawba, Hickory, Statesville, Winston-Salem, Greensboro, High Point, and more.